The contest Username you specify when you create a contestant account at any contest powered by ContestBurner. A link to your Facebook, Twitter, YouTube or other social media accounts you have connected to your contestant account. The number of points you have attained in each contest you have entered. The website does not collect any other data that can identify its visitors. Creating, editing, tracking and administering contests both on our site, on clients sites and within a variety of social media sites. 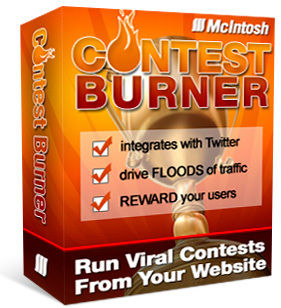 Sites like Facebook & Twitter allow ContestBurner to better track and administer a contest utilizing customized “apps”. If you authorize the ContestBurner app at any social media website you are sharing your information & access to your account with ContestBurner. We will only display or utilize this information in reference to the contests that you have joined or that you might be interested in. This information is not used for any other purpose. If you have installed ContestBurner software on your server, on your Facebook page or elsewhere in order to create & run a contest we will require authentication of our app in order to use certain functionality. This will be used exclusively to run the contests you create.